A small form factor, Super-35mm-sized, CMOS, 4K sensor and MFT interchangeable lens mount are just the beginning when discussing JVC's GY-LS300 4KCAM Handheld S35mm Camcorder. The GY-LS300 is part of JVC's 4KCAM line of cameras, which can record 8-bit 4:2:2 HD Signals at up to 60P at 50 Mb/s. This camcorder supports dual codec recording, allowing to capture two different codecs, .mov and AVCHD, simultaneously to its dual SDHC/SDXC media card slots using optional media cards. The camcorder incorporates 3G-SDI and HDMI outputs, supporting 4K output over the HDMI out. Supporting wireless streaming to a variety of streaming services while simultaneously recording HD to an optional memory card is a strength of GY-LS300. It also supports IP network remote control, remote viewing, metadata editing, and FTP of clips across a network using optional network connections and adapters. This is for the camcorder body only and does not include a lens. However, the camcorder features an MFT mount that allows you to use a wide variety of full-frame, PL, C, and EF mount lenses with optional adapters. It also features both a flip out 3.5 LCD view screen and flip up EVF. A detachable handle provides two XLR audio inputs, each with phantom power. The GY-LS300 features a JVCKENWOOD AltaSens 4K CMOS Super 35mm image sensor and a Micro Four Thirds (MFT) lens mount. This allows you to use Super 35mm Cinema lenses with optional adapters, which will retain their native angle of view. When the camera is used with MFT, Super 16, and other size lenses, using JVC's proprietary Variable Scan Mapping feature will allow you to maintain the lens' native angle of view. This gives filmmakers the flexibility of using widely available MFT lenses as well as high-end cinema lenses. It is also possible to attach the camera to microscopes and other devices using a MFT/C-mount adaptor. The GY-LS300 records QuickTime (.MOV) file format. You can connect the camcorder to a 4K Ultra HD monitor with a single HDMI cable and view the camera's live 4K signal. You can also playback recorded files directly from the camera. In addition, the GY-LS300 down-converts UHD signals to standard HD for output through the built-in SDI or HDMI connectors. The camcorder body incorporates a filter selector wheel that features a clear, 1/4, 1/16, and 1/64 ND filter choices. 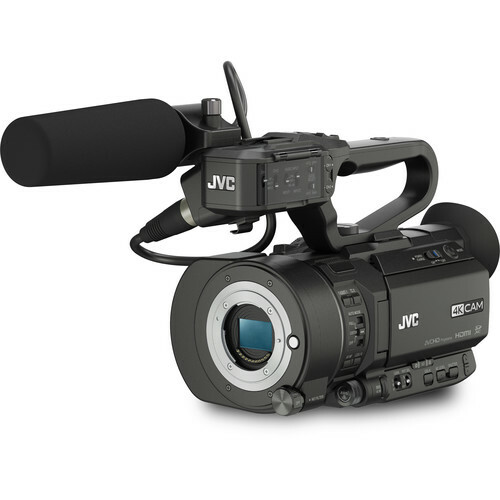 All camcorders in JVC's 4KCAM family record 4:2:2 HD signals up to 60p at 50 Mb/s, making them an ideal camera for general HD production work. 50 Mb/s files are stored in the QuickTime (.MOV) format for easy editing. Conventional AVCHD (4:2:0) recording provides wide editing compatibility in an array of standard HD and SD formats. GY-LS300 4KCAM Handheld S35mm Camcorder (Body Only) is rated 4.4 out of 5 by 41. Rated 5 out of 5 by C from A contender for more than a gh5. This is theater quality Maybe the best cinema camera out now, not because of the image quality, which is freaking awesome, but because of the price! I never experienced what the previous reviewer said about some traveling line going up and down the screen. Maybe he/she has a defective unit, but I've never experienced that and in haven't read anything similar from any other owners that posts their work on YouTube and Vimeo. Even as a verified buyer I think that person is trolling. Anyway I enjoy using this camera because the video quality is really superb. I'm definitely producing industry standard content and any capable potential owner of this will be able too as well. Rated 5 out of 5 by Joseph from This is an affordable movie camera. So, I have been using this for a few days and I love it. Everything that I loved about the JVC HM170 in terms of the menu and the knobs plus the AMAZING ND Filters, great sensor image quality and features. I bought the Metabones adapter (not the speedbooster) and there is a slightly less than 2x factor, it seems to me. So, my 50mm was more like an 85mm than 100mm, for example. But the zoom feature is incredible! I bought the Lexar Pro SDXC cards and they work beautifully with this camera. The LS-300 truly represents the best technology on the market for a prosumer-grade/professional-grade cinema camera. I have a feeling that this is going to be my favorite camera, ever. Rated 5 out of 5 by Bob from bargain First impressions: The build quality of this camera is very poor, I would rate it 2 out of 10. If you buy one, plan on purchasing a EVF or monitor, because the LCD is barely adequate. Build quality aside, this camera is amazing-interchangeable 4/3 mount lenses, with the ability to adapt the camera to lenses capable of covering the super 35 mm sensor. 4K, built in ND filters, supplied shotgun mic and XLR sockets. Excellent optical quality. Selling for less than three thousand dollars. There isn't anything like it in this price range. Rated 5 out of 5 by Steve from Whooh Mert! I have been using the LS300 for nearly a year now (over 7 short docs and a dozen regional and national TV spots). At first I was skeptical, and covered myself with double system audio and a second camera, a BMD Pocket Camera. Since then I have been using it as an A camera, intercut with my two Pocket Cameras. I am very impressed with both the image, which Mert (below) denigrates as less than a Sony handicam, and the audio, which matches well with my Tascam. The image is actually as good as any camera out there, and is only hampered by the 8 bit cliff. But if exposed correctly, it is network broadcast quality. Many are trying to bury this affordable alternative to the high-priced spread, I've used Sony FS7s and FS5s, and the LS300 is superior to both. Don't believe the nay-sayers... This camera is the best affordable camera out there, and deserves some respect. Rated 3 out of 5 by RJ from Where is JVC support??? After much anticipation, I purchased this camera, expecting it to be a work horse, as the ads state. As a 50% run and gun - 50% studio / controlled shooting environment, I take see the potential for a crisp image, but with much fine tuning. The concerns are obvious - cheaply made plastic body, ultra flimsy view finder, a basically useless hand strap. The not so obvious in my findings anyway, is the audio issue - a low-to-high wavering of loud audio (dance floor at a wedding), even when the audio switches are set to manual. This creates an entire event shot with wavering audio - not good at all. I placed a call into JVC support. After 2 weeks,, no return call yet...still waiting...Come on JVC - let's beef up the support! Rated 5 out of 5 by Mogwat from Me encanta la mejor opcion!! Me sorprendio mi nueva camara es todo lo que yo necesitaba . grabar en modo cine con sensor 35mm y en 4K. posibilidad de hacer streaming directamente desde la camara. El lente de regalo Rokinon supero toda espectativa muy luminoso y robusto da confianza. Lo unico que no me gusto es el material plastico de la camara se ve a primera impresion muy fragil . pero luego puedo entender que reduce considerablemente el peso. Las actulizaciondes de fireware van de maravilla y es como tener un camara nueva. espero que JVC siga optimizando mas la camara. si lo recomiendo a un amigo 100%. Rated 5 out of 5 by David from Very Nice Picture I used this camera for community theater. I recently tested it with a variety of lenses from a B4 (old ENG lens), Canon 24-105mm and Panasonic 14-140mm. Very versatile. I like the ability use the Super 35 setting or set the sensor to almost any size the the variable scan it offers. I used the V Log setting and got great low-light performance that easily graded. I shot in manual mode yet still can't figured out how to use the auto settings, which I can't seem to make work (like auto iris, auto white balance). Not important, but would be good to figure out. I don't think it's very good to hand-hold however because any larger lens you put on it would make the camera front heavy. So it always goes on a tripod. But that's fine, I shoot community theater and that's how I work. I use my Panasonic GH4 as my wide-shot (I always shoot with two cameras) and it matches well with just minor tweaks. What parfocal zoom lenses with O.S. are available for the LS300? Why aren't the new upgraded specs for this camera reflected in the description? How it is now may persuade potential users away not knowing how powerful and capable this camera is. I shall alert the web department as to the updates to the camcorders firmware. Please understand that in keeping a catalog with over 200,000 products current, sometimes there is a lag. We thank you for telling us about this and hope we have not caused any inconvenience. What color spaces besides REC709 are available on this camera (like LOG)? Is there any adapter available for the LS-300 to connect Sony A-Mount and E-mount lenses? Yes There are I like the MTF (from England) adapters but fotodiox make some inexpensive adapters as well. we are interested in this jvc gy-ls300 4k camera, we have super16mm PL lenses here can we use with this camera ? what is the price for the adaptor ?which adaptor good for this camera and blackmagic MFT mount 4k or 2.5kcamera ? According to Craig Yanagi of JVC at about 6 minutes into the Zacuto first look video (Vimeo video number 121192570), (with Variable Scan Mapping) the camera is able to capture the light passing through the glass in its native angle of view... . There is also an animation at about 6:08 into the video showing VSM adapting the GY-LS300's Super 35mm sensor to a 16mm image circle. Unlike with other Super 35mm cameras, your Super 16mm lenses will almost certainly work with the GY-LS300.